Windsor is a photographers dream and this little route is designed to give you some great shots, especially in the summer evening light. Starting from the middle of Windsor at the junction of Peascod Street and High Street. From here you could wander up Castle Hill for a bit and find a good spot for a classic view of the outer walls of the castle. But perhaps you might like a less obvious direction. We suggest you head down into Peascod Street for some modern street scenes. The fairly steep angle of the street is particularly useful to photographers as after only a short while you can turn around and see a beautiful view of the top of Peascod Street (generally festooned with flags and bunting in summer) with the Castle behind in the distance. If you have a good long lens, we recommend that you keep walking down till you are around the junction with Oxford Road East. The view back up the hill here can be wonderful in the afternoon light and at weekends when there are plenty of shoppers the effect is even more pronounced. Looking up is always a good idea on Peascod Street. Quite a few old signs and the ghosts of even older shop signs can be found hereabouts. Next carry on down Peascod Street to the junction of Victoria Street where you can turn left and head east. After a couple of minutes you will pass a square of stunning almshouses which are well worth a stop. A little further along Victoria Street you will find a small park called Bachelors acre. Explore every corner and you may well find the odd surprise that will make a great photograph (look at the Queens shoes!). Return to Victoria Street and continue on to the t-junction with Sheet Street. Turn right and continue past the barracks (no photography here please) and then turn left down Brook Street. Some very pretty Victoria cottages will lead you on to the expanse of one of Windsor’s treasures, The Long Walk. The doundle row of trees were originally planted in the reign of Charles II. If you want to spend the rest of your day photographing deer, turn right and walk along for a mile and a half to the gates of the deer park. However if you are not looking for nature scenes head up toward the castle in search of that iconic shot. At the gates, turn left onto Park street, pausing perhaps for a photo and a pint at the lovely Two Brewers pub, locally famous for its flower displays. Continue in a stright line to the heart of Windsor and as you pass your starting point you will see some excellent old buildings in front of you. 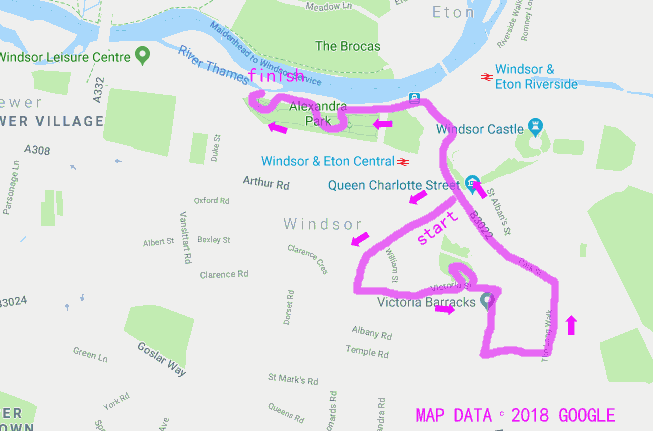 Much of central Windsor dates to the seventeen hundreds and there are quite a few that go back quite a bit further than that. Head down to the river and explore both sides of the bridge.. Some really great very long exposure shots can produce stunning results if you have a 10-stop ND filter to play with. Get creative and see what you can produce. In the early evening the sun falls on the picturesque swans on the Windsor side of the river so head along here going upstream. You will also see ducks, geese, coots, moorhens and sometimes the odd cormorant. If you are lucky one of the old steamboats will be moored up on the riverside. The reflextions in the polished brasswork can give you a terrific shot to remember. Carry on along the embankment and you will eventually get to Brunel’s (admittedly less than spectacular) railway bridge as well as the memorial to Sidney Camm which is a full size replica of a Hawker Hurricane airplane and is definely something worth thinking about shooting. There are other little delights around here such as the old icecream kiosk and the bandstand in Alexandra Gardens, but you will have been out for a few hours now. If the light is fading, head back into town and review the shots you have taken in one of Windsor’s lovely pubs.